Recently I found myself browsing the adhesive aisle at AC Moore. I am always amazed by the wide variety of adhesives available for all different craft projects, so I thought I'd ask fellow members of Boston Handmade which adhesives they have bonded with over the years. Betsy of Stonehouse Studio claims that no adhesive is the best adhesive! She tries to avoid any type of glue. She also offers the tip to always refer to your work as chemically bonded instead of glued... good idea! 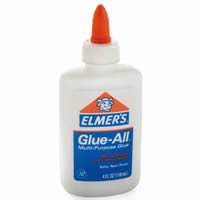 Crystal of Vintage by Crystal votes for Elmers Glue because it is cheap, dries clearly, and is very strong. Lucie of Lucie Wicker Photography also employs Elmers Glue for her cards, but uses Mod Podge for her other mixed media projects like photos on canvas and ceramic coasters. Katy of Muchacha K, also a fan of Mod Podge, enjoys that Mod Podge offers the double duty of gluing and sealing. I have to agree that Mod Podge is a great go-to adhesive. Katy also reccomends E6000 as a heavy duty bond. Chris of Christine Marie Art relies on Golden Soft Gel medium, a versatile and archival adhesive, for her mixed media work. These gels range in consistency and transparency which is great when experimenting. Jessica of Reclaimed to You uses Golden Matte Medium when she is collaging photographs and found papers onto wooden panels. For other layers and especially porous materials like sewing patterns and book pages she use Bees Wax melted with Damar Resin and paints it on to the top of the porous surface which fuses the material to the paper below. For Jessica, the key to the success of this process is that after adhering the first (bottom) layer of images and papers the piece needs to be pressed under weight for at least a day before adding additional layers of materials. 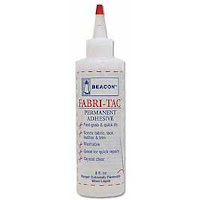 Louise of The Hole Thing swears by the fabric adhesive Fabri Tac. Before she discovered Fabri Tac, she used to hand sew her labels into her garments, but Fabri Tac does the job quickly and efficiently. Bonus points for its washability and ease of use on leather. 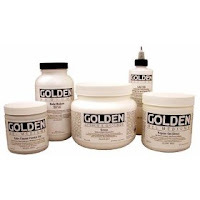 I hope you enjoyed this overview of favorite adhesives by the members of Boston Handlade. Always remember to test a new adhesive out before putting it to work on your main project! Use adhesives in a well ventilated area, and PLEASE don't krazy glue your finger tips together. great tips. Jessica: what do you put between that first layer and the weights so that you don't glue the art to the stuff on top?! yes, these are great tips! i've always been so confused about the variety of different glues offered and which is used for what. thank you so much for the article, allison! miss you guys! The adhesive I use is between the wood and the underside of the paper, so the top of the paper has no adhesive on it, so I put books or other heavy, flat objects down with no sticking issues. Wow, what a useful post! I'll check back on this one as reference in the future. I don't use adhesives on a regular basis, but you never know what type of project I'll try in the future. This is just what I needed! I am in the process of finding an adhesive for my labels too. Thanks so much. I love fabric Tac! That stuff glues that fabric like cement. Awesome post Allison!